enhances alertness and exhilaration, while an excess of positive ions enhances drowsiness and depression. The Ion Effect. New York: E.P. Dutton, 1977. For the past several years, the Defense Advanced Research Projects Agency (DARPA), the military research and development agency tasked with maintaining U.S. military technological superiority, has engaged in research on direct neurological control of weapon systems.1 Although international law does not create a per se prohibition on the use of these weapons, the potential misuse of such weapons radically challenges tradi- tional notions of criminal responsibility by effacing the distinction between thought and act. 2 This Note suggests that the development of such weap- ons requires a more expansive doctrine of command responsibility in order not to vitiate established legal principles regarding criminal accountability for war crimes. technology, such as for the control of prosthetics of wounded soldiers and the guidance of unmanned aerial vehicles (UAVs). In addition, Part I briefly surveys academic research in the field to determine how far the project has advanced. The classified nature of much of DARPA's research precludes alternative approaches. Part II considers the use of neurological weapons in the context of international law. First, it investigates the current law on prohibited weap- ons and describes recent efforts to enlarge the scope of banned weapons. Part II then accounts for the historical difficulties in implementing prohibi- tions against the use of advanced technologies in war. Indeed, great dispar- ities exist between the law of warfare, which pronounces that the means of injuring enemies is not unlimited, and its implementation. Based on this examination of the current law of warfare, this section concludes that weapons employing brain-machine interfaces most likely do not violate international humanitarian law (IHL). Yesterday, hell froze over when an Argentine court embargoed or, in effect, froze up to potentially $19 billion in Chevron assets in the South American country. Now it's time to fight it out on the ice. Chevron, which now has about $2 billion in assets in Argentina, has sworn it will never pay a dime to cleanup the contamination it left behind in the Ecuadorian rainforest. Said former General Counsel Charles James: "Not till hell freezes over, and then we will fight it out on the ice." Chevron has defied Ecuador's courts, refusing to pay an enforceable $19 billion judgment and forcing the Ecuadorians to file lawsuits to seize assets in Ecuador, Brazil, Canada and Argentina to obtain the damage award for one of the world's largest oil-related environmental disasters. The ATF, Office of Strategic Intelligence and Information (OSH), Field Intelligence Support Branch, has prepared the following report to provide intelligence and analysis on outlaw motorcycle gangs (OMH's) in the United States military and Government. Some key findings: OMG support clubs are recruiting a large number of active-duty military personnel - utilizing active-duty military personnel and U.S. Department of Defense (DOD) contractors and employees to spread their tentacles across the United States. Since 2007, ATF and its UNLAWFUL enforcement partners, domestic and abroad, have discovered the documented OMG members have been employed as Federal employees and contractors, active-duty military, reservists and National Guardsmen. Numerous OMG members, prospects and associates are also employed with State and local government agencies. Besides being members of the police and fire departments, they work for the parking authority, water and sewage departments, etc., and 911 call centers, and even in nuke plants. . .
ROTHSCHILD'S Minions - Dr. Patrick DeSouza a member of the CFR | Leeb Capital Management . . .
Capital management and investments for profits requires creating NEW "DEEP" MARKETS. We have discovered that intentionally causing copper plumbing water leaks has fostered new companies to mitigate the damage while decreasing property owners cash reserves and savings. . .
For example, new "DEEP" markets are created as a result of intentional and deliberate large scale manipulations of destabilizing building structure integrity, and the business opportunities that emerge from damage and repair requirements. We have investigated a number of properties, contacted insurance agents and plumbing companies and have discovered wide-spread damage from water copper plumbing pin hole leaks which are a major cause of water leak damage and continual repair costs to property owners. Rothschild has created new "DEEP" markets by requiring corrosive additives to the municipal water supplies, such as fluoride, chlorine, etc. These toxic chemicals are sold to the populations as health benefits ignoring the real science of human damage, but then again causing injury profits the corporate structure, too. Damage caused by continual plumbing pin hole water leaks in the copper piping has become an enormous expense to property owners. These small leaks can drip for sometime before being detected and dependent on how observant occupants are determines how much damage results. These leaks can not only damage carpets, pads, drywall, furniture but can travel between walls to lower levels and become a source of mold if not handled by professionals with the equipment to extract and dry out the materials. Ever wonder why there are so many companies that specialize in leak detection and water extraction? Ever think about leak detection companies? Certainly leaks will occur but when the intentional goal is to cause water leaks we must rethink our circumstances. We consulted with several insurance companies to determine how wide spread these water leaks are and were told, "water damage from plumbing are the main insurance claims they deal with". It is important to know that if your water damage is not a sudden event the insurance companies will not provide coverage. If the insurance company determines you had a water leak and it was a slow leak you are not covered, this is according to State Farm. We asked several other insurance companies about their water leak claims and what areas they were involved with and in Southern California these companies had information on Pasadena and Santa Monica where plumbing leaks were frequent, and both areas are fluoridated. . .
We have learned that in the last two years plumbing water leaks have increased, and we also know the increased pulsed electromagnetic frequencies are causing damage as well. All wireless communication devices - i.e. WiFi, cell phones, computers, cell towers, antennas, smart meters, and more, create building material fatigue. EVERYTHING is made of frequencies and the continuous effects of pulsed microwave frequencies act like small earthquakes causing damage and the need for repair - a NEW "DEEP" BUSINESS. . . We learned that American Leak Detection is a business model that is benefiting the international bankers coffers. . . as you will learn from reading the link below that was found on the Plain Sight website aka Rothschild and companies. Plain Sight and its team of Yale scientists have been working with Leeb Capital Management to develop next generation quantitative tools to provide Leeb Capital an analytic edge. In keeping with Leeb Capital Management’s focus on resources, Dr. DeSouza is also Executive Chairman of Water Intelligence plc, a publicly traded London-based company that provides metering and "leak detection" solutions for the water industry. Dr. DeSouza has twenty years of experience in investment banking and practicing securities law. Over the course of his career, he has significant experience with respect to billions of dollars of M&A and corporate finance transactions both in the United States and internationally. Dr. DeSouza has also served at the White House as Director for Inter-American Affairs on the National Security Council. In addition to articles on economic policy, he is the author of Economic Strategy and National Security (Westview 2000) which includes contributions from former senior members of the Bush and Clinton Administrations. He has been a visiting lecturer at the Yale Law School where he taught a course on global wealth management. He is also a member of the Council on Foreign Relations. Dr. DeSouza is a graduate of Columbia College, Yale Law School and Stanford Graduate School where he wrote his doctoral dissertation on foreign investment in the United States. Contributed to U.S. innovation policy at the highest levels - including at the White House, the Defense Advanced Research Projects Agency (DARPA), and major national universities . . . We license our intellectual property to third parties ranging from Fortune 500 companies such as Raytheon and Lockheed Martin (defense) to smaller companies such as BrainScope Corporation (medical). In early 2014, the Department of Defense Sexual Assault Prevention and Response Office asked the RAND National Defense Research Institute to conduct an independent assessment of the rates of sexual assault, sexual harassment, and gender discrimination in the military — an assessment last conducted in 2012 by the Department of Defense using the Workplace and Gender Relations Survey of Active Duty Members. The resulting RAND Military Workplace Study invited close to 560,000 U.S. service members to participate in a survey fielded in August and September of 2014. This volume presents results from this survey for active- and reserve-component service members in the Army, Navy, Air Force, and Marine Corps. It includes estimates of the number of service members who experienced sexual assault, sexual harassment, or gender discrimination in the past year, as well as detailed information about the characteristics of those incidents, decisions to report, and experiences with response and legal systems for both male and female service members. It also describes service members' beliefs and attitudes about these problems. The solution is simple. To protect military information support operations from developing the same sort of taint that psychological operations now have, they should be made unambiguously truthful. PSYOP (now MISO) doctrine should be rewritten to ban misleading or false content or disseminating messages with false attribution. Clear (and publicly stated) policies prohibiting falsehood and MISO doctrine that is free from "black" tools and approaches will signal to U.S. allies and target audiences alike that MISO personnel are honest, credible and trustworthy sources of information. Credible sources are, after all, the most persuasive. There may still be times when the Department of Defense wants and needs to mislead or manipulate an enemy. Most of these will be tactical and short-term needs, and either directly protect the lives of U.S. forces or trick adversaries into exposing themselves to harm, or both. To preserve U.S. credibility in those cases where "black" tools are necessary, they should be separated completely from military information support so that MISO is never touched by the taint of falsehood. Commanders who desired such capability could employ it, but the “black” tools would be separated with a policy firewall from truthful efforts to inform, influence, and persuade. This would promote greater collaboration with public affairs and civil affairs, and would facilitate the realization of strategic communication principles. And, to keep things honest, the residual "black toolkit" could be called something evil-sounding, like "deceptive manipulation" or even....PSYOP. Dr. Christopher Paul is a social scientist at the RAND Corporation, a nonprofit institution that helps improve policy and decision-making through research and analysis. He is the author of Whither Strategic Communication?, Information Operations - Doctrine and Practice, and co-author of Enlisting Madison Avenue. ‘‘Wars of subversion and counter subversion are fought, in the last resort, in the minds of the people,’’ a leading British authority on counterterrorism concluded in 1971.1 More than three decades later, there is growing recognition among U.S. government officials, journalists, and analysts of terrorism that defeating al-Qaida— arguably the preeminent challenge to U.S. security—will require far more than ‘‘neutralizing’’ leaders, disrupting cells, and dismantling networks. The much greater threat is posed by the global jihadist movement that Usama bin Ladin continues to inspire. That move- ment, characterized by some observers as a worldwide insurgency,3 threatens the United States’ interests in regions as diverse as central Asia, the Middle East, and Southeast Asia. In war everything is simple, but even the simple things are extremely difficult. Although the United States and its allies have waged successful campaigns to discredit totalitarian ideologies such as fascism and communism, these operations have never come readily to liberal democracies. Part of the explanation can be found in the uneasiness open societies tend to have about engaging in psychological manipulation, lying, and other mendacious and ‘‘underhanded’’ practices that are likely to be part of any full-scale campaign against a hostile ideology.7 That this campaign would necessarily involve efforts to discredit a religious viewpoint—no matter how extreme that viewpoint might be—also clashes with liberal notions about the importance of religious liberty and the need to maintain the separation of church and state. More fundamentally, waging a blatantly ideological struggle seems quite unnatural to Americans and other Westerners, who tend to downplay intangible factors such as ideas, history, and culture as political motivators, preferring instead to stress relatively more concrete driving forces such as personal security and physical well-being. To achieve key national security objectives, the U.S. government and the U.S. Department of Defense (DoD) must communicate effectively and credibly with a broad range of foreign audiences. DoD spends more than $250 million per year on inform, influence, and persuade (IIP) efforts, but how effective (and cost-effective) are they? How well do they support military objectives? Could some of them be improved? If so, how? It can be difficult to measure changes in audience behavior and attitudes, and it can take a great deal of time for DoD IIP efforts to have an impact. DoD has struggled with assessing the progress and effectiveness of its IIP efforts and in presenting the results of these assessments to stakeholders and decisionmakers. To address these challenges, a RAND study compiled examples of strong assessment practices across sectors, including defense, marketing, public relations, and academia, distilling and synthesizing insights and advice for the assessment of DoD IIP efforts and programs. These insights and attendant best practices will be useful to personnel who plan and assess DoD IIP efforts and those who make decisions based on assessments, particularly those in DoD and Congress who are responsible for setting national defense priorities and allocating the necessary resources. In addition to identifying where and why efforts have been successful, assessment can help detect imminent program failure early on, saving precious time and resources. An accompanying volume, Assessing and Evaluating Department of Defense Efforts to Inform, Influence, and Persuade: Handbook for Practitioners, offers a quick-reference guide to the best practices presented here for personnel responsible for planning, executing, and assessing DoD IIP efforts. The company has a patent pending for a delivery system for implanting an array of neurotransponders next to a peripheral nerve by means of a hypodermic needle. The individual transponders can be linked together to form a cluster, and to make removal simpler. Each neurotransponder is the size of a grain of salt (about 1 mm in length and 0.25 mm in diameter), small enough for dozens to be implanted simultaneously in a single location. COMMENT: If you only read the excerpt below you will see the scheme to inflict falsified science policies of global warming hidden by the real climate change which is the weaponization of the weather and the use of HAARP. You will see the plans that are fully engaged to absorb the Arab World into the genocide programs of which the majority of people are unaware. Soft Kill - Slow Kill techniques are demonstrated though the illusion of water scarcity. We are witnessing a silent weapons system of Attrition Warfare that is intended to bring about countless deaths - orchestrated by heartless government corporations and international bankers. We can sit idly by - or engage by getting the TRUTH out about the falsified science behind global warming and climate change - The real climate change that is the covert use of weather weapons. Inform everyone you know of the real water facts - please help warn these innocent victims and get the information out of these monstrous plans put in place to take their lives. Troubled Waters - Climate Change, Hydropolitics, and Transboundary Resources . . . The Arab World will be one of the regions most affected by global warming. According to the Climate Change Index (CCI) developed by Maplecroft, a British risk analysis consul- tancy, it is home to 5 of the top 10 countries most exposed to the impacts of climate change: Djibouti, Egypt, Iraq, Morocco, and Somalia. The Arab countries face numerous environmental challenges and have to reconcile many conflicting priorities, from promoting economic diversification, ensuring water supply and food security, and furthering environmental protection and conservation to adapting to the impacts of global warming. Egypt ranks as the second most exposed country. With the vast bulk of its population con- centrated in the Nile Valley and Delta, it is at high risk of inland flooding; it also faces extreme risk of negative health effects. Iraq, fifth most vulnerable, is at high risk for coastal flooding, exposure to extreme temperatures, susceptibility to decreasing food availability, and the negative health problems these create. Morocco and Somalia, at 6th and 10th place respectively, are both expected to experience increased risk of inland flooding and extreme temperatures. In the critical Persian Gulf, all six countries of the Gulf Cooperation Council (GCC)—Bah- rain, Kuwait, Oman, Qatar, Saudi Arabia, and the United Arab Emirates (UAE) —are pro- jected to suffer significant repercussions from global warming. Bahrain, 11th on the CCI, has a relatively small land mass that is in danger of being inundated as sea levels rise with climate change. Qatar is especially susceptible to inland flooding, with 18.2 percent of its land area and 13.7 percent of its population less than 5 meters above sea level. Bahrain and Qatar, together with Kuwait, figure among the countries exhibiting “extreme” vulnerability on the Maplecroft index. Oman, Saudi Arabia, and the UAE are all rated “highly” vulner- able. Many other countries in the region are also expected to be significantly affected by climate change. Yemen ranks among those “extremely” vulnerable, and Jordan, Lebanon, Libya, and Tunisia score “high” on the CCI. Water Pressures - Most of the Arab world falls under the classification of extreme water scarcity, defined by the United Nations as anything below 1,000 cubic meters per capita of average annual water supply. Many countries of the region already use more than 40 percent of their total available water resources, and more still are projected to do so in the next two decades (see annex 1). Global warming will exert new pressures on water resources around the world. It is hardly surprising that some of the most parched regions of the world also suffer from perennial unrest. Extrinsic factors, such as rising food prices, can fan civil discord. Yet it is often the dependence of agriculture on scarce water supply that lies at the heart of the problem. YOU are UN-SUSTAINABLE . . . a Partial List of what's NOT Allowed . . . people and animals, too! Figures 2 and 3 illustrate the publication trend of the 10 most productive countries in nanotechnology paper publications in the SCI database. Overall, the United States published the most nanotechnology papers, and growth was faster after 1991 than before 1991. Before 1991, the USA, Japan, Germany, France, and England (the United Kingdom) were the major countries in nanotechnology research. After 1991, several addi- tional countries became involved in this arena. China experienced faster growth in the last 10 years than other countries/regions, which made it the second most productive country beginning with 2003. South Korea also showed rapid development after 2000. In four years, it exceeded Italy, Russia, and England to become the 6th most productive country in 2004. Table 9 shows the top 20 countries with more than 200 papers whose papers were most frequently cited per paper in literature (based on average number of cites per paper). Papers from Switzerland were cited the most frequently per paper. The United States, England, Germany, and France had both a high average number of cites and a high number of papers published. Table 10 reports the institutions with more than 100 papers with the highest average number of cites. The papers from the AT&T Bell Labs, European Mol Biol Lab, and Harvard University were cited more than other institutions. University of California Berkeley, MIT, University of California Santa Barbara, and Harvard University had more publications than other high impact institutions. In the list, 17 of the institutions were in the Unites States, two in France and one in Germany. Most of the highly cited institutions were universities. NutraPoison a BioWeapon - "NutraSweet Horror - TO EMBALM..OR NOT TO EMBALM"
There is an excellent book written in the 70's by Eustace Mullins called "Murder by Injection: The Medical Conspiracy Against America". In the very beginning it shows exactly how alloapthy came into being. You can find it as a free pdf online, highly worth the read. This man was so ahead of his time it's not even funny. He even wrote about fluoride causing neuro-toxic effects upon the brain and how it was used in Russia to 'control' the population and David Rockefeller went there to learn about this. 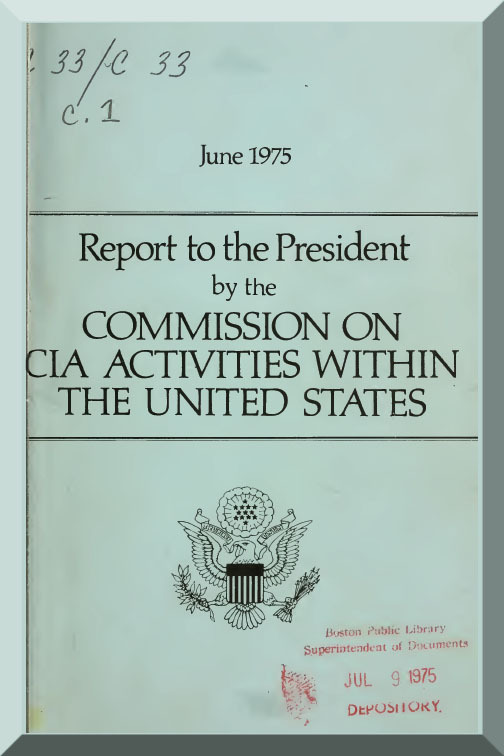 Please download the 173 page US Senate report on the CIA using behavior control. 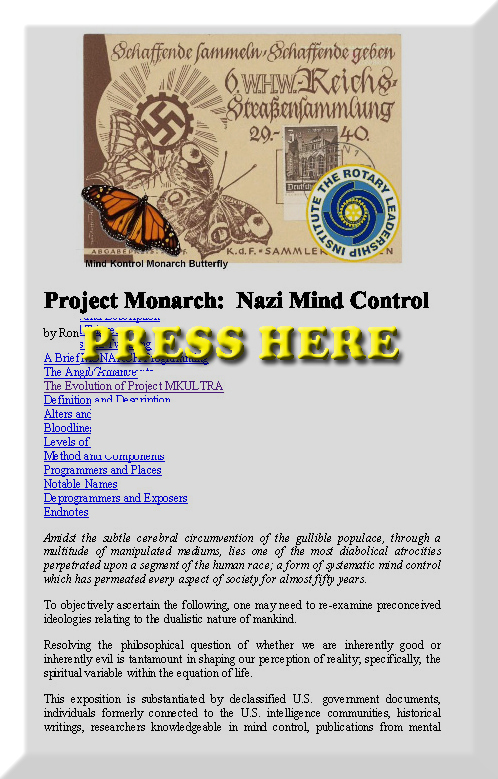 Project MKUltra -The CIA's program of research in Behavioral Modification. Joint Hearing Committee on Intelligence Subcommittee on Health and Scientific Research. Committee Human Resources United States Senate Ninety Fifth Congress First Session August 3, 1977 US govt Printing Office Washington 96-408 0 DC 1977. Chapter 10 Preface Communication and the ability to interact with the environment are basic human needs. Millions of people worldwide suffer from such severe physical disabilities that they cannot even meet these basic needs. Even though they may have no motor mobility, however, the sensory and cognitive functions of the physically disabled are usually intact. This makes them good candidates for Brain Computer Interface (BCI) technology, which provides a direct electronic interface and can convey messages and commands directly from the human brain to a computer. BCI technology involves monitoring conscious brain electrical activity via electroencephalogram (EEG) signals and detecting characteristics of EEG patterns via digital signal processing algorithms that the user generates to communicate. It has the potential to enable the physically disabled to perform many activities, thus improving their quality of life and productivity, allowing them more independence and reducing social costs. The challenge with BCI, however, is to extract the relevant patterns from the EEG signals produced by the brain each second. A BCI system has an input, output and a signal processing algorithm that maps the inputs to the output. The following four major strategies are considered for the input of a BCI system: 1) the P300 wave of event related potentials (ERP), 2) steady state visual evoked potential (SSVEP), 3) slow cortical potentials and 4) motor imaginary. Recently, there has been a great progress in the development of novel paradigms for EEG signal recording, advanced methods for processing them, new applications for BCI systems and complete software and hardware packages used for BCI applications. In this book a few recent advances in these areas are discussed. In the Ô¨Årst chapter hardware and software components along with several applications of BCI systems are discussed. In chapters 2 and 3 several signal processing methods for classifying EEG signals are presented. In chapter 4 a new paradigm for P300 BCI is compared with traditional P300 BCI paradigms. Chapters 5 and 6 show how a visual evoked potential (VEP)-based BCI works. In chapters 7 and 8 a visuo-motor-based and natural motor control-based BCI systems are discussed, respectively. New applications of BCI systems for control and biometry are discussed in chapter 9. Finally, the recent competition in BCI held in 2010 along with a short summary of the submitted projects are presented in Chapter 10. X Preface As the editor, I would like to thank all the authors of diÔ¨Äerent chapters. Without your contributions, it would not be possible to have a quality book, help in growth of BCI systems and utilize them in real-world applications. Dr. Reza Fazel-Rezai University of North Dakota Grand Forks, ND, USA Reza@UND.edu 1 Hardware/Software Components and Applications of BCIs Christoph Guger, G√ºnter Edlinger and Gunther Krausz g.tec medical engineering GmbH/ Guger Technologies OG Austria 1. Introduction Human-Computer interfaces can use different signals from the body in order to control external devices. Beside muscle activity (EMG-Electromyogram), eye movements (EOGElectrooculogram) and respiration also brain activity (EEG-Electroencephalogram) can be used as input signal. EEG-based brain-computer interface (BCI) systems are realized either with (i) slow cortical potentials, (ii) the P300 response, (iii) steady-state visual evoked potentials (SSVEP) or (iv) motor imagery. Potential shift of the scalp EEG over 0.5 ‚Äì 10 s are called slow cortical potentials (SCPs). Reduced cortical activation goes ahead with positive SCPs, while negative SCPs are associated with movement and other functions involving cortical activation (Birbaumer, 2000). People are able to learn how to control these potentials, hence it is possible to use them for BCIs as Birbaumer and his colleagues did (Birbaumer, 2000, Elbert, 1980). The main disadvantage of this method is the extensive training time to learn how to control the SCPs. Users need to train in several 1-2 h sessions/week over weeks or months. The P300 wave was first discovered by Sutton (Sutton, 1965). It elicits when an unlikely event occurs randomly between events with high probability. In the EEG signal the P300 appears as a positive wave about 300 ms after stimulus onset. Its main usage in BCIs is for spelling devices, but one can also use it for control tasks (for example games (Finkea, 2009) or navigation (e.g. to move a computer-mouse (Citi, 2008)). When using P300 as a spelling device, a matrix of characters is shown to the subject. Now the rows and columns (or in some paradigms the single characters) of the matrix are flashing in random order, while the person concentrates only on the character he/she wants to spell. For better concentration, it is recommended to count how many times the character flashes. Every time the desired character flashes, a P300 wave occurs. As the detection of one single event would be imprecise, more than one trial (flashing of each character) has to be carried out to achieve a proper accuracy. Krusienski et al. (Krusienski, 2006) evaluated different classification techniques for the P300 speller, wherein the stepwise linear discriminant analysis (SWLDA) and the Fisher‚Äôs linear discriminant analysis provided the best overall performance and implementation characteristics. A recent study (Guger 2009), performed on 100 subjects, revealed an average accuracy level of 91.1%, with a spelling time of 28.8 s for one single character. Each character was selected out of a matrix of 36 characters. The U.N. Arms Trade Treaty: Are Our 2nd Amendment Rights Part Of The Deal? Full text of "The Lucifer Effect Understanding How Good People Turn Evil ( ISBN 978 1 4000 6411 3)"
The overall size of these energy efficient "markets" is undoubtedly large, including for SMEs. Some estimates put the annual energy efficiency investment need at close to $100 billion per year over a twelve-year timespan in developing regions alone if cost- effective energy efficiency opportunities are to be realized (McKinsey, 2008). NOTE: In this report, an SME is defined as an institution with a maximum of 300 employees, maximum revenues/ turnover of $15 million, and maximum assets of $15 million. Market projections in this report cover the ten-year period 2014-2023. The SME opportunity is largest in the wastewater treatment sector, which makes up about one-third of the total, with small hydro, water treatment, onshore wind power, solar PV, geothermal and bioenergy the next largest SME opportunities. A number of the renewable and nonrenewable technologies are expected to present significant opportunities for SMEs as well and they are each discussed in turn with the top three opportunities for each region highlighted in Figure E3. While energy efficiency is not covered specifically, both the abatement potential and SME opportunity are large. Climate change will have its largest impacts on developing countries, with poor populations particularly hard hit and unable to adequately adapt (World Bank, 2013a). There are ongoing efforts to assist developing countries with efforts to mitigate and adapt to climate change through the deployment of appropriate climate and clean technologies. However, the main thrust of many of these efforts is to transfer technology from the developed world without regard to local industry involvement. There is an opportunity for developing countries to pursue a complementary approach, emphasizing building up the capabilities of local firms to participate in the business opportunities surrounding climate change. Climate change therefore represents an opportunity for developing countries to build local green industries that can drive sustainable economic growth and provide environmental benefits. This report offers insight to policy makers and other stakeholders seeking to develop competitive green industries1 in developing countries. The Climate Technology Program (CTP), housed at infoDev, empowers developing countries to proactively and profitably adapt, develop, and deploy climate-smart technologies and business models. The CTP is creating a global network of Climate Innovation Centers (CICs) that provide a country-driven approach to addressing climate change and fostering green growth. The CICs are designed as locally owned and run institutions that provide a suite of services and venture financing that address the specific needs of local climate technology SMEs and entrepreneurs. At the global level, the CTP is providing linkages between CICs by facilitating market entry, access to information, and financing for the private sector, while also offering important tools for policy makers to measure and improve domestic climate innovation activities. Currently, the program is establishing CICs in eight countries: Kenya, the Caribbean, Ethiopia, Ghana, India, Morocco, South Africa and Vietnam. THE ROTHSCHILD's: The History Of The House Of Rothschild . . . and Who Rules the World . . .
architecture which supports its functionality: to make the person a walking online node, beyond luggable mobile phones, PDAs and smart cards. We are referring here, to the lowest common denominator, the smallest unit of tracking- presently a tiny chip in the body of a human being. CAUTION: IEEE SSIT | IEEE Society on Social Implications of Technology . . .The Society on Social Implications of Technology (SSIT) of the Institute of Electrical and Electronics Engineers (IEEE) is concerned with how technology impacts the world, and with how the application of technology can improve the world. The Society focuses on issues such as: humanitarian engineering; environmental issues including climate change, green technologies, and sustainable design; privacy and security; other economic, health, and safety implications of technology; engineering ethics and professional responsibility; engineering education including k-12 and engineering education in social implications of technology; history of technology; public policy related to engineering, technology and science; health and healthcare technologies and impact; reliable energy and social issues related to energy, and social issues of information technology and telecommunications. Spectra Research Institute - Direct Brainwave to Computer Interface Development . . .
is backing Veolia in central and eastern Europe. It has taken direct stakes in the capital of several subsidiaries, including Dalkia Polska (energy in Poland), Veolia Voda (water services in the Czech Republic, Hungary, Poland and Slovakia, and potentially in Russia and Ukraine). Similarly, the World Bank’s International Finance Corporation and Proparco (part of the French Development Agency) are co-shareholders in Veolia Water AMI (Africa, the Middle East and India). Veolia Environnement also manages a global multiservice contract for the pharmaceutical firm Novartis, in Basel, Switzerland, covering the supply and management of water, production of steam, water, superheated water, compressed air, cold water and ice, collection and treatment of industrial waste and solvent recycling. Finally, Veolia Environnement has formed a joint venture, Défense Environnement Services, with Europe’s leading military naval contractor, DCNS (see box page 41). All these examples demonstrate Veolia’s capacity to respond to industrial firms seeking a single partner capable of managing all of their non-core activities combined with performance guarantees in terms of quality and savings. Adapting to changing behaviors can also mean offering Internet access to passengers. To address that need, Veolia Transport and Orange Business Services have teamed up to launch a Wi-Fi connection aboard express coaches serving the La Défense business district of Paris. Sometimes, responding to consumers’ needs can mean helping them benefit from new regulations. In Italy, for example, Veolia Energy is helping homeowners to upgrade their heating installations, by marketing a purpose-designed technical and financing package to take advantage of a tax break under new Italian legislation. Veolia Environnement businesses address many of the key challenges facing the world today: climate change, the environment, access to water and public health, working with institutions in order to provide its services as effectively as possible. An active contributor to public debate. it took part in the “Grenelle” round-table on the environment, in 2007, a path breaking event in which government, civil society and business came together to craft a contractual framework to combat climate change, preserve biodiversity and prevent health hazards resulting from pollution. Because of its business impact on each of these subjects, and as a world leader in its business sectors, Veolia was able to speak with authority in formulating proposals on four key themes, namely: conserving water resources; using waste as a resource; managing energy demand and promoting renewable energies along with decentralized energy production; and implementing a sustainable mobility policy. The highlight of 2009 in the international arena, of course, was the United Nations Climate Change Conference, held in Copenhagen in December, attended by leaders from 193 countries. Veolia Environnement was there to advocate its proposed solutions. Veolia Transport, for example, presented its initiative called “Bridging the gap: pathways for transport in the post 2012 process”, in partnership with GTZ (a German international cooperation enterprise for sustainable development), the International Association of Public Transport (UITP), and the UK-based Transport Research Laboratory (TRL). Together they worked to include transportation issues in the climate negotiations. Realizing that most of the CO2 emissions caused by transportation occur in an urban setting, Veolia Transport and its partners presented a series of scenarios for sustainable land transportation on the occasion of the Summit, with suggestions for a low carbon road map. At the 5th World Water Forum in Istanbul, in March 2009, and in association with AquaFed, the federation of private water operators, Veolia reaffirmed the need to make the right to access to safe water and sanitation effective for all, a right supported by many of those attending. WARNING: The ZOMBIE Apocalypse - even the Pentagon has a Plan - CONOP 8888 . . .
with the common cold, another purely hallucinogenic based (BZ derivative) turns the masses violent when sprayed as an aerosol. an article which explains this. This article was censored for some months and had to be republished. See if you can guess why. The Pentagon defense plan which illustrates threats from zombies, CONOP 8888, was submitted on April 30, 2011. Its creators were military personnel in Omaha, Nebraska. Foreign Policy stated that they experimented with a scenario “that could never be mistaken for a real plan” to train for a diverse selection of possible threats. The three main points are applicable to a variety of attacks, as pointed out by Business Insider: 1) protect the civilian population by keeping a defensive perimeter, 2) eradicate all possible threats, 3) provide aid to civil authorities in the restoration of law and order. ADVISORY: The Planet Hacking Rules « The Dish - For better or for worse, we’re talking about hacking the planet. In order to understand the importance of this document it is necessary to search the Rand Corporation and the Tavistock Institute . . . The Rand Corporation is behind mind control techniques to crete a global society that is manageable and to drastically reduce the global population. . This report analyzes some approaches that have been sug- gested for optimizing individual performance, in the context of potential actions of an adversary who may not be guided by the same cultural or eth- ical concerns that govern US military operations. The measures considered include medical supplements; non-invasive modifications of brain effective- ness, for example by training and sleep optimization; neuro-pharmacology; and neural implants. The tasking for this study was to evaluate the potential for adversaries to exploit advances in Human Performance Modification, and thus create a threat to national security. In making this assessment, we were asked to evaluate long-term scenarios. We have thus considered the present state of the art in pharmaceutical intervention in cognition and in brain-computer interfaces, and considered how possible future developments might proceed and be used by adversaries. DRONES - Dept. of the ARMY - April 13, 2007 - "Joint Targeting" . . . This publication has been prepared under the direction of the Chairman of the Joint Chiefs of Staff (CJCS). ItsetsforthjointdoctrinetogoverntheactivitiesandperformanceoftheArmedForcesofthe United States in operations and provides the doctrinal basis for interagency coordination and for US militaryinvolvementinmultinationaloperations. Itprovidesmilitaryguidancefortheexerciseofauthority by combatant commanders and other joint force commanders (JFCs) and prescribes joint doctrine for operationsandtraining. ItprovidesmilitaryguidanceforusebytheArmedForcesinpreparingtheir appropriateplans. ItisnottheintentofthispublicationtorestricttheauthorityoftheJFCfromorganizing the force and executing the mission in a manner the JFC deems most appropriate to ensure unity of effort in the accomplishment of the overall objective. a. Jointdoctrineestablishedinthispublicationappliestothecommandersofcombatantcommands, subunified commands, joint task forces, subordinate components of these commands, and the Services. b. The guidance in this publication is authoritative; as such, this doctrine will be followed except when,inthejudgmentofthecommander,exceptionalcircumstancesdictateotherwise. Ifconflictsarise between the contents of this publication and the contents of Service publications, this publication will take precedence unless the CJCS, normally in coordination with the other members of the Joint Chiefs of Staff, has provided more current and specific guidance. Commanders of forces operating as part of a multinational (alliance or coalition) military command should follow multinational doctrine and procedures ratifiedbytheUnitedStates. FordoctrineandproceduresnotratifiedbytheUnitedStates,commanders should evaluate and follow the multinational command�s doctrine and procedures, where applicable and consistent with US law, regulations, and doctrine. The Egyptian Masonic Satanic Connection . . .
HUMAN AUDITORY PERCEPTION OF PULSED RADIOFREQUENCY ENERGY J.A. Elder and C. K. Chou Motorola Florida Research Laboratories 8000 W. Sunrise Blvd. Plantation, FL 33322 - Motorola has created pulsed mind control technology that is being used as a weapons system, globally . This is global weaponized weather warfare. Not in the control of the US but patented in the US and developed in the US. . Run by the energy companies, Cheney, Bush, Rothschild, Rockefeller, Rumsfeld, Dan Quail, Carl Rove The people behind the Project of the New American Century . Our military has been hi-jacked by the corporate structure that does not acknowledge life. Certainly there still are good and decent people that would NOT use these weapons on U.S. civilians, however, it is important to note that they do not make policy. . . The use of these speed-of-light-delivery weapons ARE in fact being used on hundreds of thousands of civilians, globally, right now and have been for many decades. What we know are policies are adopted to create the illusion of safety when, in fact, we ARE the enemy being hunted by this predatory corporate construct that has been posing as a representative government for the people and is NOT . . . Don't be fooled by doublespeak and the time honored DELPHI Technique (schemed by the Rand Corporation/Tavistock Institute) that is the corporate meeting format used to conduct corporate meetings with agendas presented by trained facilitators, manipulating and guiding the attendees to consensus, the idea of agreement, when the meeting outcome was predetermined PRIOR to the meeting. . This Air Force policy you are about to read is trickery . . . We are NOT being protected from risk of damage or harm from DEW Directed Energy Weapons and this is NOT a safety policy. Likely, following the recommendations by submitting Safety Investigation requests will confirm covert operational DEW successes upon the population and specific persons. . Due to the FACT that we are NOT currently represented reports that we submit go to the perpetrators of these energy assaults and are logged into the data base for monitoring military accomplishments. 1.1. A DEW is a system using a beam of concentrated electromagnetic energy (including but not limited to lasers and high power microwave systems), or atomic or subatomic particles primarily as a direct means to kill, injure, disable, or temporarily incapacitate people or destroy, damage or temporarily incapacitate property or materiel. 1.2. Acoustic weapons use sound across the entire frequency spectrum to kill, injure, disable, or temporarily incapacitate people. Acoustic weapons, although outside the Joint definition of DEW, have effects and hazards more similar to DEW than to conventional weapons. Acoustic weapons will follow the same safety policy as DEW. Comment - These weapons are false plasma weapons that hit nerves creating false pain using lazar, RF and pulsed EMF technologies. Important to note the plasma in the chemtrails also causes damage to physical property, power in vehicles, can disrupt batteries - causing shorter battery life, can short equipment out, radios can be disrupted and attacked. High intensity directed energy to nociceptors/nerve endings that identify pain on our skin i.e. when you are burned you pull your hand back . . are pulsed energy ADS and are able to connect on a neuron/nociceptors (nerve) level whereby the technology causes a false pain so people will go on medications and pills . . . So really you are not in pain but these technologies can create the illusion of pain, This is part of the active denial system (Active Denial = pain and pleasure - rewards or torture = mind control torture weapons - these are the means and weapons for global mind control implementation - another example if a politician does not vote for what the controllers/criminal crime families want the politician can be tortured with these weapons . . . Below is a government contract for the technology being used by covert criminals upon the populations, globally. 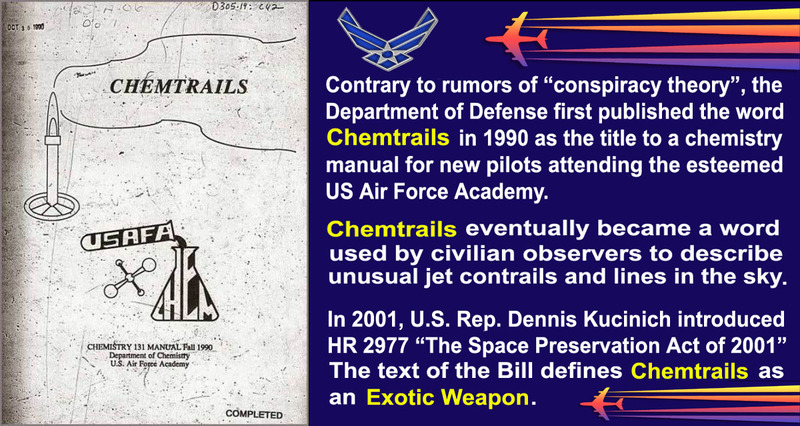 . .
Chemtrails are for changing the atmosphere into a PLASMA for Directed Energy weapons of Mass Destruction, using Weaponized Weather. directed energy weapons, the Weaponized power grid, and weaponized telecommunications grid. Weapons of Mass Destruction - CONTRACT UNIVERSITY OF FLORIDA M67854·Q4·C-5074 - The Peripheral Pain System. The detection of pain begins with a complex set of peripheral afferents (nociceptors) that detect and encode a great variety of stimuli. These peripherally encoded events are relayed by axons into the central nervous system (spinal cord, thalamus, cortex) where the information undergoes the complex assembly required to produce a localized, conscious perception of pain (Cooper and Sessle, 1993). Recent advances in nociceptor characterization have permitted classification, In Vi/TO. ofatlcast 8 distinct nociceptive phenotypes. Our laboratory has shown that sensory cells of the DRG are comprised of discrete, internally homogenous, classes of capsaicin (OC) sensitive (types I, 2, S, 7, 8 and 9) and insensitive (types 3, 4, 6) populations with distinct capacities to respond to SHT, PGEz, protons, ACh and ATP (Martenson et al., 1994; Cardenas et al., 1997; Cardenas et ai, 1999; Petruska et aI., 2000, 2002; Cooper and Cooper, 2001). We have used lipid soluble fluorescent tracers to define the specific distribution of nociceptors into viscera, joints and skin. Preliminary studies have indicated tha~pu1ationsofskinin~ ~S. It is these nociceptors that are likely to receive the maximal burst _ from laser plasmas A) Objectives /Concept. ADVISORY - Damaging Our Children . . .Dr. Olle Johansson PhD Sweden - Immediate Need for Strict Health Protections from RADIATION -The evidence for non-thermal adverse effects on human health is overwhelming and the Precautionary Principle should be immediately reflected in guidelines for public and occupational EMF exposures. -- Children are at particular risk and preventative measures ensuring minimal EMF exposure should be of the highest priority. Some 100 years back, we learned the hard lessons of ionizing radiation and the need for strict health protections – now we mustopenly face the possibility that we must take a seat in life’s school and learn again. This time it is about non-ionizing radiation. ALERT: Kissinger's 1974 Plan for Food Control Genocide . . . THE MATRIX DECIPHERED - Innocent US Citizens Targeted and Tortured by Electromagnetic Pulse Microwave Frequencies FROM DR ROBERT DUNCAN - "THE MATRIX DECIPHERED"
NEW GOVERNMENT DOCUMENT EXPOSED . . . World-wide leadership is "up for grabs" and follows first mover Advantage - world system of slave labor THIS LOOKS LIKE TROUBLE . . .when ever the members and expects consist of the list below this has proven to be programs that are connected to total dominance of the human population under policies such as Silent Weapons For Quiet Wars - and I quote Page 11 of Silent Weapons - "Energy is the key to all activity on the face of the earth, it follows that in order to attain a monopoly of energy, raw materials, goods, and services and to establish a world system of slave labor, it is necessary to have a first strike capability in the field of economics. In order to maintain our position, it is necessary that we have absolute first knowledge of the science of control over all economic factors and the first experience at engineering the world economy." Alert - We Can't Wait - World-wide leadership is "up for grabs" and follows first mover Advantage . . . Some brief excerpts . . .
"Realizing the Full Potential of Government-Held Spectrum to Spur Economic Growth"
Specify and fund the ongoing Scalable Real-World Test Service Needed (a Test City and Mobile Test Service) to test sharing of Federal Bands and Public Safety with industry . . TEST FOR PUBLIC SAFETY . . . .
See the Map on Page 12 . . . Looks like - WAR using frequencies . . . what do you think? Modify Rules to allow - General Authorized access Devices to Operate in two bands in the NTIA Fast Track List - specifically the 3,550 - 3,650 MHz (radar bands) Second band to be determined by FCC and NTIA . . . Page 12 - Use extended TV White Space System Already in Operation as the starting system . . . WEAPONS. . . Legal Implications of the Soviet Microwave Bombardment of the U.S. Embassy 1-1-1977 . . .
Illuminati News: Who Killed William Cooper?